“I’ve chosen to preach about the war in Vietnam because I agree with Dante, that the hottest places in hell are reserved for those who in a period of moral crisis maintain their neutrality. There comes a time when silence becomes betrayal. The Gulf of Tonkin tapes, which can be listen to at the National Security Archives web site, at the address below, were recorded by LBJ on August fourth 1964. The seven recorded phone calls of that day were between LBJ at the white house and Robert McNamara at the Pentagon. On the day of the evening of the supposed attack on US war ships stationed in the Gulf of Tonkin, off the cost of North Vietnam. You will see that the corporate goon squad, “the pentagon” and the corporate fascist, “the politicians” were completely in league with each other to create a, Casus belli, a reason to go to war. They had been harassing North Vietnam under an operation called OPLAN-34A in an attempt to foment the North Vietnamese into attacking a US destroyer but had not had any luck with that plan so they hatched another. You will see that the planning including the targeting of specific sites and bombs to be used; the timing of the news releases; when to hold the news conferences to make the announcement of the impending attack on North Vietnam. Down to the minute, just before the eleven o’clock news Johnson and McNamara went over these scripts, line by line, paragraph by paragraph. Taking advice from New York and Texas bankers, to plan the attack, along with the advice of military commanders in theater before the incident took place. As you will hear in clip # 3, McNamara at one point said “and our ships are allegedly to be attacked tonight”. This is the face of the capitalist fascist at work. To annihilate to destroy any challenger, to kill two to three million people just to keep the control of the resources of all south east Asia and simply make money while doing it. It is the height of the glory of the cold war propaganda machine at work, to create an incident so they could co-opt the American industrial machine for their Owen purposes again, to lie and mislead the American people into war. I could go on and on but the one thing to understand, and is well documented in these taps, is that the military are in league and willingly execute the orders of wall street, they are nothing but a bunch of hired goons to do the bidding of the wall street power brokers, the bankers for the rich. They are completely co opted by money and power. The military are nothing but SS goons doing the bidding of the ultimate power brokers. They are the SS for Wall Street. They knowingly do these things. You refer to the address below which I guess you must have forgotten to include. As a veteran of the Nixon-Kissinger Fig Leaf Contingent (Vietnam 1970-72), I would cordially quibble with the heading for this article. I believe that “Reshaping the Vietnam Narrative” would more accurately describe the fact that the U.S. Government — particularly the Pentagon — tried and failed once before to shape the narrative of the disaster during its unfolding from 1961 to 1975. In fact, the massive government attempts to propagandize the American public into believing a pack of historic lies deserves prominent place in any true narrative, as that same government and Pentagon seem hell bent on trying once again not just to lie about what actually happened in Southeast Asia (Vietnam, Cambodia, and Laos) but what actually transpires in the Middle East, Africa, and Ukraine today. In short: The U.S. Government and Pentagon lie, just to keep in practice; just so they won’t forget how. Having lived through those years, and knowing what I know, I cannot help but think that this undertaking by the Pentagon represents apocalypse. It is the end of all hope for American recovery. It is a rejection of honesty, reality, reason and remorse. Vietnam did not begin with Tonkin Gulf, but with a coup d’etat to remove the one man who may have had the integrity to stop it. “I have a rendezvous with death”, read the poem he admired. History suggests that he knew the fate he might confront should he wager the stakes. Another voice began to speak against the moral abyss that threatened to snuff out the beacon of righteousness and liberty America believed itself to be. We remember him annually with tributes to his message of equality, and celebrate his soaring oratory with clips from the prophetic words of the “Mountaintop Speech”. He is rarely remembered for the more stirring speech, “Why I am Opposed to the War in Vietnam”. Every word he spoke still rings true. As a country, we remain, “The greatest purveyor of violence in the world today”. That speech, more certainly than any words he spoke against racial injustice, contained the message that empire cannot abide. Silenced, King was followed by the man who announced his death to the nation, the man who would certainly have been the next President of the United States, and who promised to end the war. RFK was also silenced. In all three cases, evidence points to State Crimes Against Democracy. The House Select Committee on assassinations determined in 1979 that JFK was killed by a conspiracy. Thomas Noguchi, Chief Medical Examiner for Los Angeles, testified that the fatal shot that killed RFK was fired at “point blank” range, eliminating any credible “lone gunman” scenario. Attorney William Pepper won a civil decision acknowledging that MLK was killed by elements of the state and federal governments. Today, we listen to blatant lies and watch as our government contradicts its own subversive deeds. Five billion dollars spent to destabilize a democratically elected government are followed by the installation of a genocidal neo-Nazi regime, and we are told that our motives are just. In the past thirteen years, we have bombed fourteen nations achieving only chaos. We are told that our sanctions against Russia are successful, while their economy grows at a rate three times that of our own. Meanwhile, Europe continues to falter, and the Global South is determined to free itself of our corrupt monetary policies. Marin Luther King Jr. was right. “The arc of the moral universe is long, but it bends toward justice”. The “American Century” is ending, and our own lies have brought that justice to bear. The strength of the rebellion of ground troops caused the military to shift to an air war. Troop morale was abysmally low, but it had not sunk to the level of general mutiny. Possibly these two statements can be reconciled. Soldiers don’t have to be actively rebelling to be nearly useless. Consider the situation of black US troops in WW2. They were fully trained, well equipped, and not worth a damn in battle. Racists of the day opined that this general worthlessness was on account of their color, which was total nonsense. The similarity I see with them and the Vietnam soldiers late in that war was the perception in each case that the prospect of death and/or dismemberment wasn’t worth the risk. “Second-rate citizens in both the States and the Army” in the first case; “fighting for an obviously lost cause” in the second. Our hearts goes out to the families of these Veterans who have died due to delayed appointments at the VA. But then think of all the thousands of Vietnam Blue Water Navy Veterans excluded from the presumption of herbicide exposure (Agent Orange) who have died because the VA refuses to give them service related status. This does not seem to provoke the conscience of Congress or the public. Does the Vietnam stigma still haunt these men and women Veterans? It’s like post war Germany when the citizens refused to admit the existence of the concentration camps and the atrocities committed there. So the next time you’re shocked by an article about the death of one or tens or hundreds of Veterans, will you think of those thousands in the Blue Water Navy? Exposure to Agent Orange has been linked to numerous health problems, including non-Hodgkinâ€™s Lymphoma, prostate cancer, Type II Diabetes, Parkinson’s disease, and other issues. In 1991, legislation was enacted that empowered the Secretary of Veterans Affairs to declare certain illnesses “presumptive” to exposure to Agent Orange and enabled Vietnam veterans to receive disability compensation for these related conditions. However, in 2002, the VA limited the authority of the Act to only those veterans who could provide orders for “boots on the ground” in Vietnam. As a result, veterans who served in the waters off the coast of Vietnam were forced to file individual claims with the VA to restore their benefits, which are then decided on a case-by-case basis. After 40 years the evidence needed for these Veterans to obtain benefits no longer exists. HR 543, The Blue Water Navy Vietnam Veterans Act of 2013, now has 251 cosponsors and needs your support. This is enough for a discharge petition to force it to the House floor. This would be an embarrassing situation to this committee. After 14 years of being disenfranchised by the Department of Veterans Affairs, the Blue Water Navy deserves its day on the House floor for a vote. The estimate is that 30,000 Veterans of the Blue Water Navy are being denied health care today. With the fiasco facing this nation with the deaths of Veterans in care of the DVA, letâ€™s not add to the count. I don’t know where the spam came into this picture. The Blue Water Navy Vietnam Veterans Association is a not for profit organisation providing important information on the Agent Orange/ Blue Water Navy issue. Well so be it. The extent of the military’s “shift to an air war,” if such a shift occurred at all, was due to the rapidly diminishing number of US infantry deployed in the field due to the policy of troop withdrawal announced in 1969 and the concurrent “Vietnamization” of the ground war. Indeed, there was a massive increase in US airstrikes during the Easter Offensive in 1972, caused not by a US troop rebellion, but by the nearly catastrophic, three-pronged NVA cross-border offensive into South Vietnam (generally unknown or unremembered by those not present in Vietnam at the time). That said, small units sometimes did begin to balk at orders. I served briefly with a platoon that had made the US nightly news when the men declined to take a truck convoy into a heavily mined and booby-trapped area, preferring to wait instead for aerial insertion by helicopter. On an earlier occasion, certain members of one of our sister companies in the 101st Airborne Division also refused to deploy to a notoriously dangerous area, though the rest of the company complied with the order to do so. 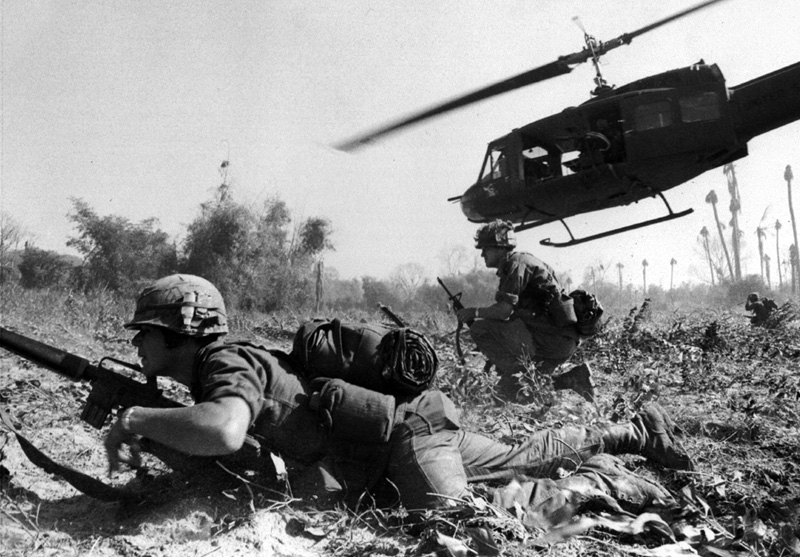 But, again, there was no general “rebellion of ground troops,” in Vietnam much less a strong one. Had any such thing occurred among the very few battalions of remaining infantry (as late as June 1972 when I returned to the US), not only would I certainly have known about it, but I would likely have seen it first hand. Troop morale was abysmally low, but it had not sunk to the level of general mutiny. I say this not out of pride, but simply to set the record straight. I fully concur with the author that we should resist all efforts to whitewash the terrible history of the Vietnam War, but we should guard against inventing history that never happened in our attempt to remember what did.